Bathrooms are becoming retreats, sanctuaries where you can rejuvenate and relax. If you are planning to remodel your bathroom, it is vital to evaluate your needs, know design trends, set goals, find inspiration and choose the right materials and contractors. 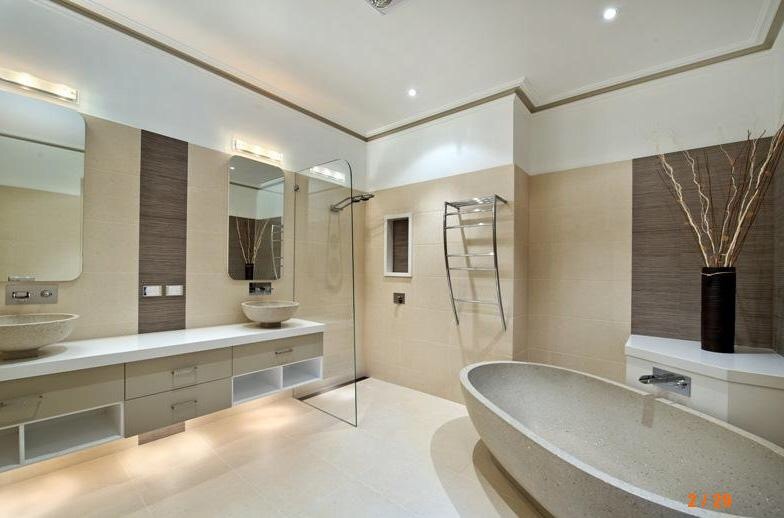 You need to have a well thought of plan for your bathroom renovation. Bathroom remodel should last for years when you update the decor ( paint, towels, shower curtain and other accessories). Then get down to the details of your bathroom remodel. Forget your unattractive bathtub and choose latest ones that are elegant, beautiful and streamlined. Consider how you primarily use a bathtub and choose a style to match your preference. Bathtubs are used mainly for relaxing soaks and they are a bold feature in your bathroom. There are many types of bathtubs for a luxury bathroom: Claw foot bathtub, whirlpool bathtubs, corner bathtubs, wooden bathtubs, copper bathtubs, walk in bathtubs. However, walk –in tubs are becoming increasingly popular due to their features like adjustable jets, handrails, seat, slip proof textures and easy to use and safety features. Choosing the right bathroom sink for your home is an essential part of remodeling. You have a variety of designs, materials and colors to choose. You have materials from simple porcelain to luxurious glass, copper, stainless steel sinks. High-end option sink style is floating sink or vessel sinks which sit on the vanity as a bowl or a rectangular vessel. They are available in wide range of materials like porcelain, glass, metal. Vessel sink designs offer a strikingly visual design. Go for updated light fixtures that will be stylish and give a good feeling in your bathroom space. Experiment with different styles and finishes to create an appealing mood. Opt for LED bulbs as they are energy efficient and give the right amount of light to the area. Fix new well designed classy knobs to your cabinets and your drawer pulls. This upgrade can transform the look of your bathroom. If you do not have cabinets, fix cabinets constructed with high quality wood and good finish for a whole new look. Fancy bathrooms need fancy toilets. There are many styles with good features to choose from like dual flush, built-in bidets, automatically raising and lowering of lids and much more. Japanese models are very popular due to their great features and they are also expensive. You have auto flush systems for toilets and monolith cisterns from good branded manufacturers. Replace your outdated worn out tiles with modern styles to take your bathroom to a whole new level. You can use your creativity to choose tiles that give a refreshing look to the whole space. Sleek fixtures instantly upgrade your bathroom. Give it a luxurious look with new matching fixtures and faucets with a classy finish of oil-rubbed bronze or brushed nickel. Make your shower experience a luxury by adding a rain shower or massaging shower head. Choose a sleek bath shower and pair it with a bath screen for the best and efficient look. Opt for a vanity unit under your basin as well as mirror cabinet on your wall. It will give plenty of storage space for your bathroom. Go for designer mirrors with fun frames and unique finishes. To get a realistic idea of how much the remodeling will cost in Dubai, it is best to choose all the fixtures, materials and finishes before the project commences. You need to explore Luxury Bathroom Designs in Dubai from retail and multi- brand showrooms like Al Shamsi which provide toolkit to create luxurious bathroom solutions.